I was also in a happy mood yesterday because my first ever BDJ (Belle De Jour) box arrived in the mail. When I first got a hold of the package, it was heavy so I was extra excited to open it. I've heard great reviews on the BDJ box so I expected a lot from them. 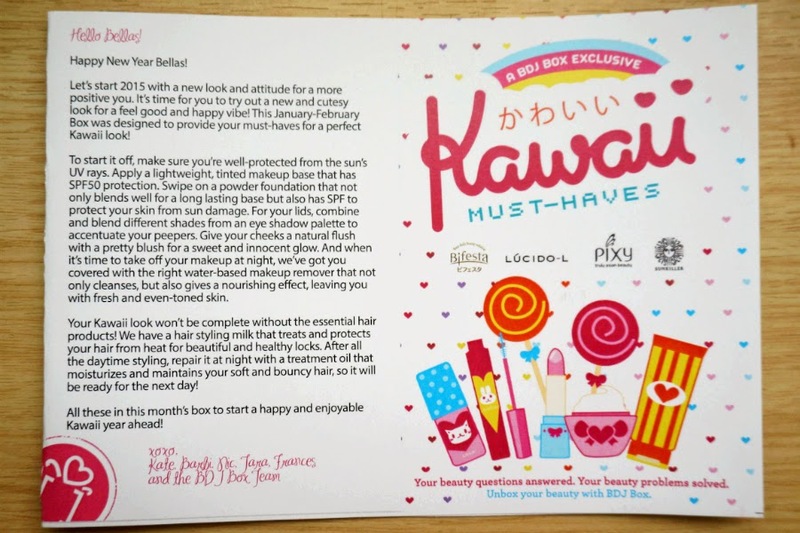 For January-February BDJ has partnered with Mandom Corporation (Japan) to "provide your must-haves for a perfect Kawaii look" with featured products Lucido-L, Bifesta, Pixy, and Sunkiller. 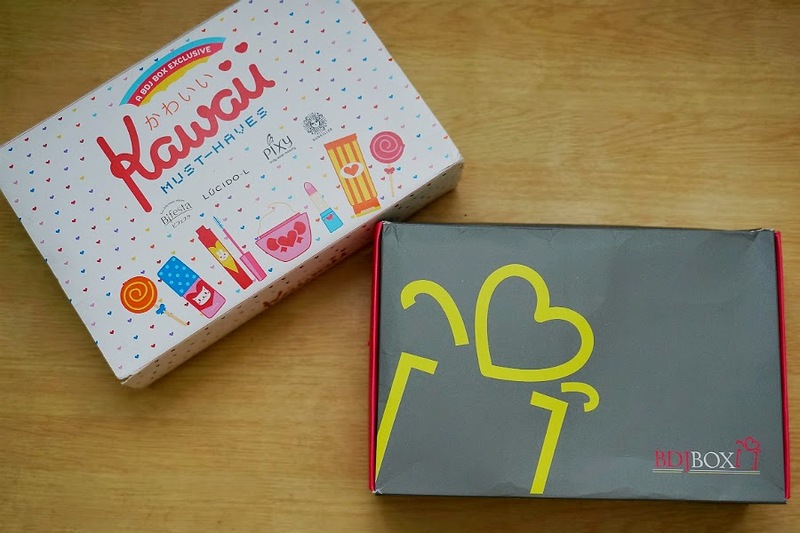 The packaging's fun, cute, and colorful motif embodied the theme perfectly. I also love BDJ's New Year message: "Start the year with a new look and attitude for a more positive you." Since this was my first BDJ box, my expectations were very reserved. 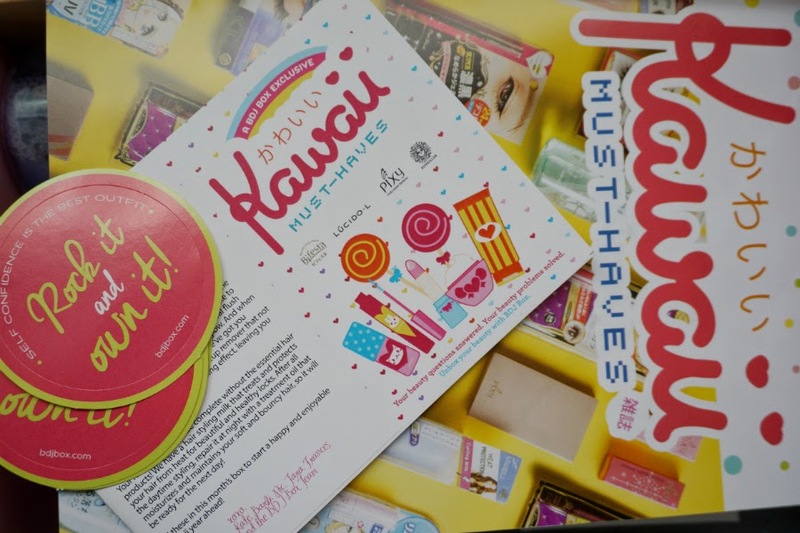 I was happy to see that this Kawaii box is very generously filled with 8 full-sized products for a complete look. 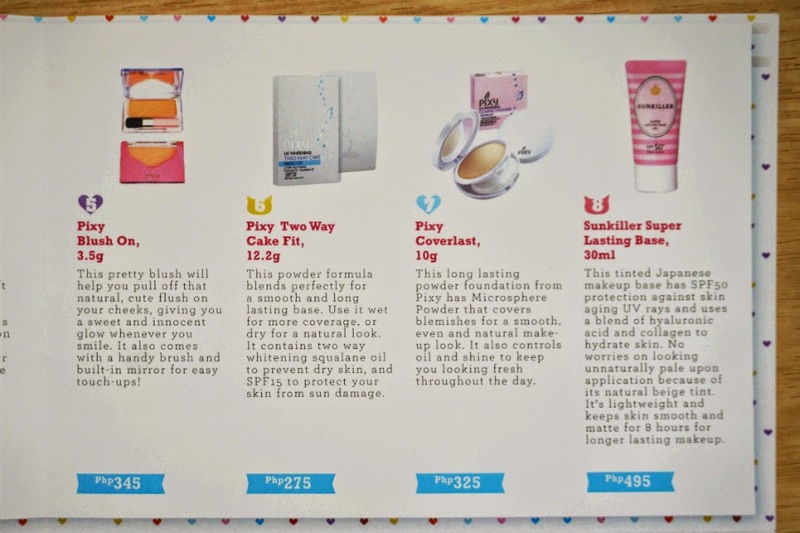 What's more, these are products that I would actually use. What a coincidence! I have been using Bifesta's Age Care Cleansing Lotion since I've run out of my favorite Haruhada cleansing water for a couple of weeks now. Hopefully, this Bright Up variant performs better. 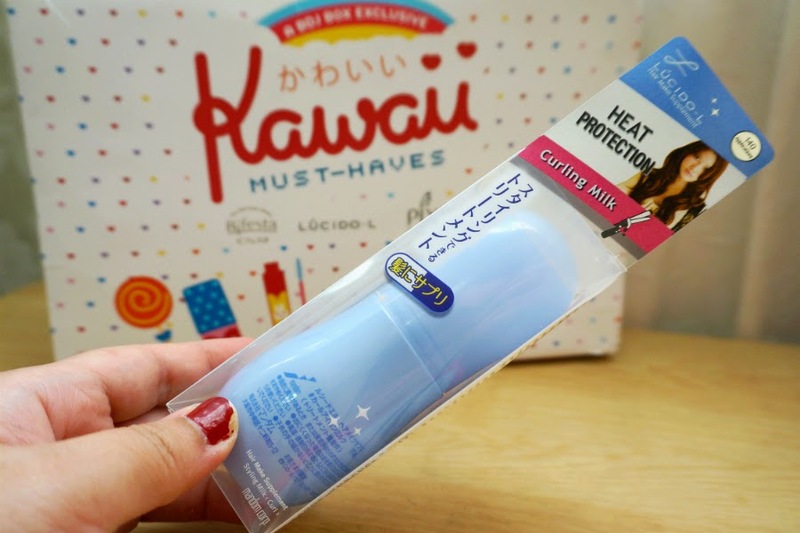 I'm still inclined to repurchase my fave Haruhada because it just perform better. Another coincidence? I'm also currently using Lucido-L products (Treatment Oil Straight and Styling Milk Straight, purchased at Watson's). I have straightened hair and both of these hair products are for curly/permed hair so I'm not sure if I would be able to use them on a daily basis. Nevertheless, I'm happy to receive these, maybe I would experiment and use them on my hair and see how it turns out. 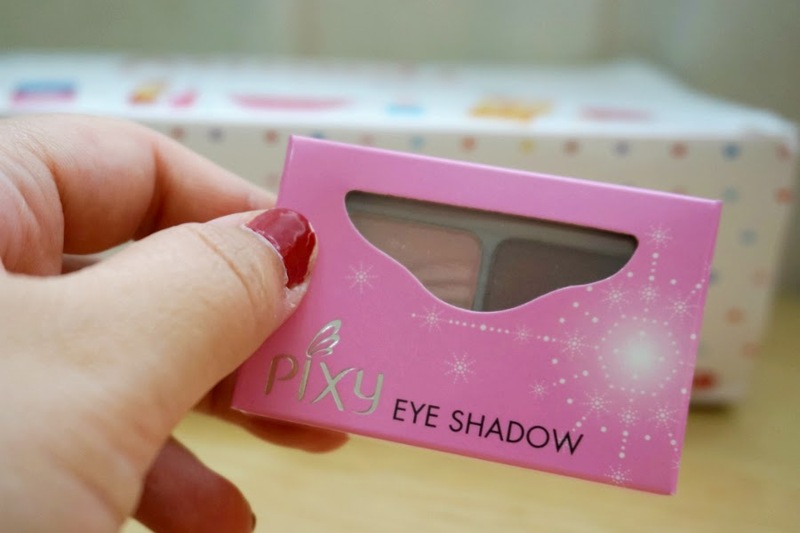 This is my first experience with Pixy so I'm glad to be able to try out their products. 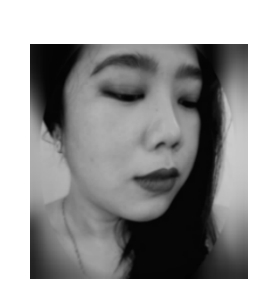 This eyeshadow duo in Romantic Poem has two complementary shades: a light pink and a darker, rich plummy red (Marsala?). Can't wait to play with this! Yey for blush! I currently into a "blush phase" so I was excited to see this in the box. Carnation Bloom is looks like a light peachy coral which I think would be perfect for a natural look. This powder is formulated for dry skin so I'm not sure if this will suite my oily-combination skin. I will try this on the next time I do my makeup and see if it suits me. If not, then I can always give this to my mother who has drier skin than mine. 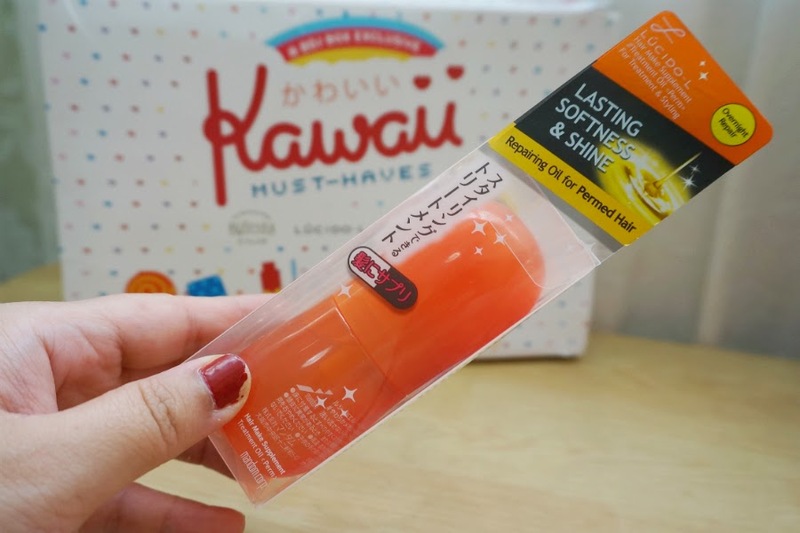 This compact powder features "Light Touch and Oil Control" so this might be the one for me. 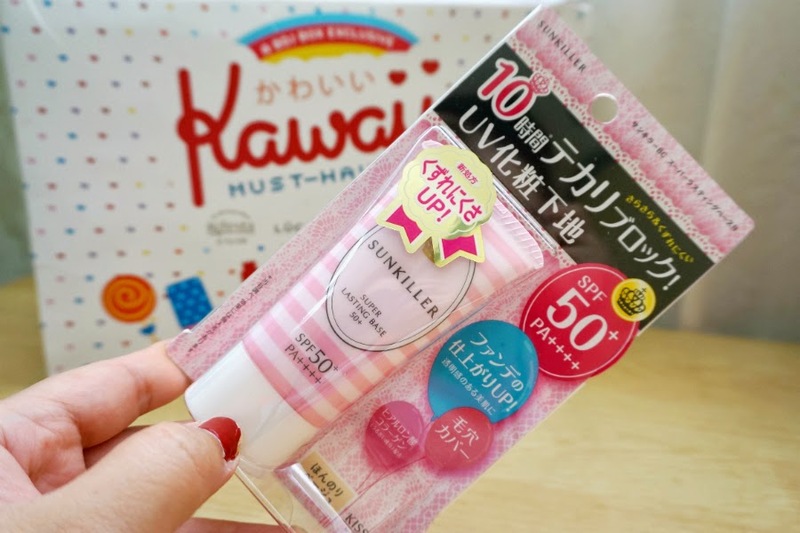 I hope that this is really lightweight as it claims and would be able to combat my oiliness. I'm still on the hunt for the perfect powder as recent purchases have been total disappointments. 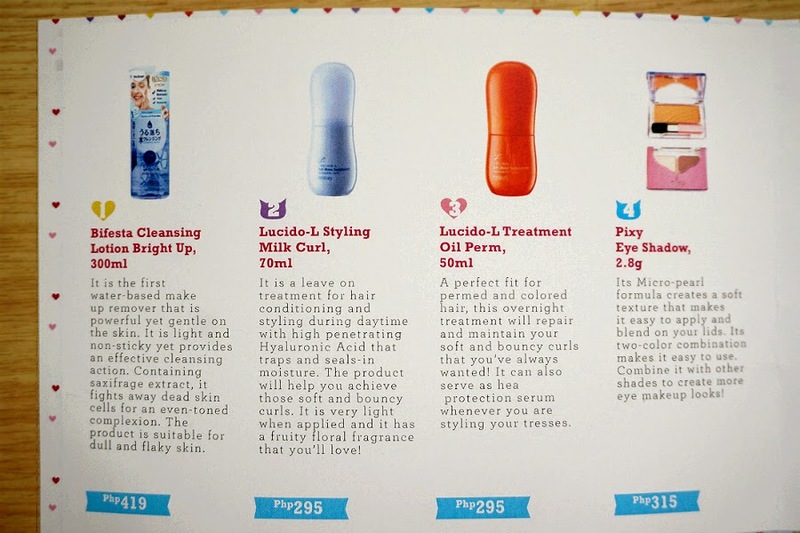 The total value of the January-February 2015 BDJ Box is P2,764.00, all for the low, low subscription price of Php 580. 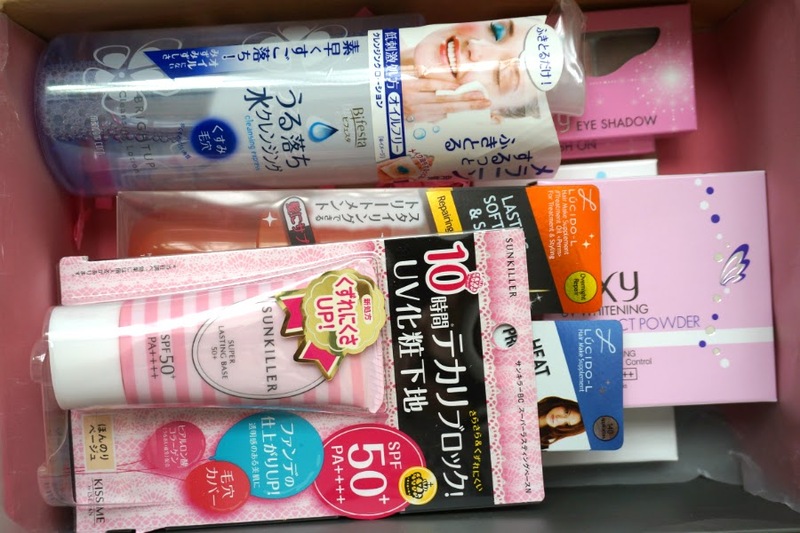 This box is value-overload, with more than four times the sub price and all eight products are full-sized. 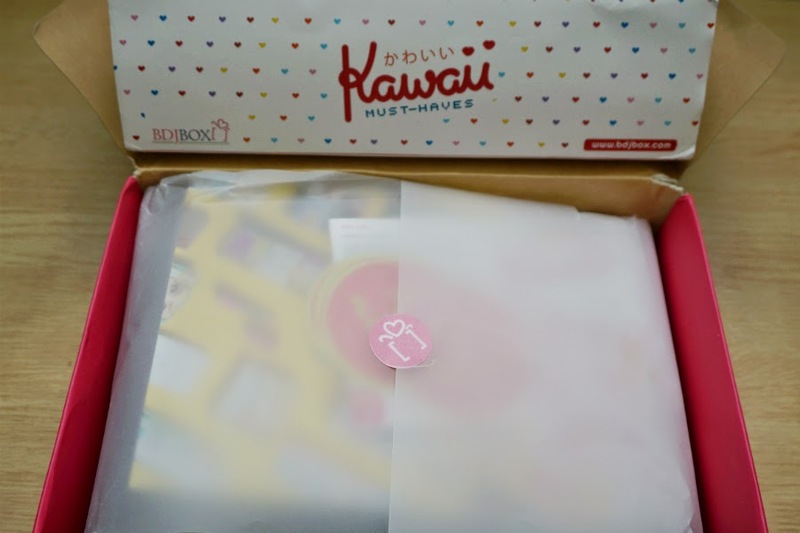 Initial Impressions: I have a really positive experience with my very first BDJ box. I got a great return of "investment" with this box because it's almost five times the value I paid for. Also, the products are not throwaways. I'm actually inclined to use (almost) all of the eight full-sized items included in the box. 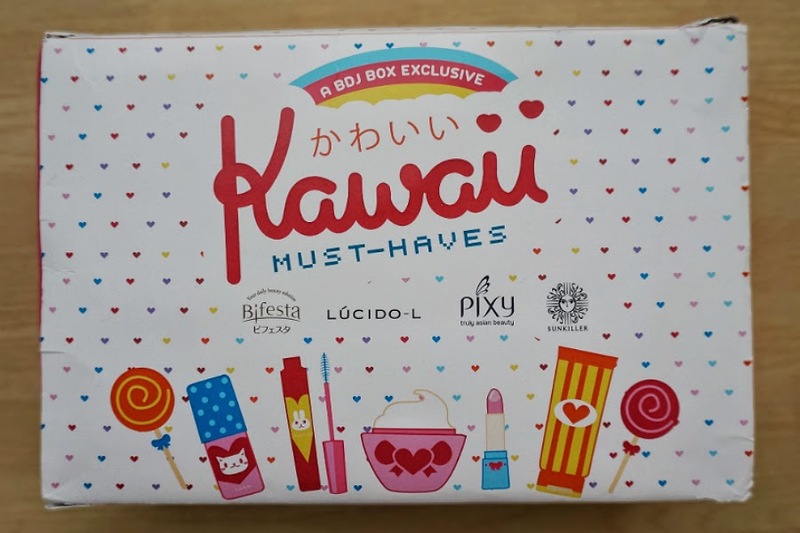 I would have loved that they include a lip product to really "complete" the Kawaii look but since everything is already full-sized, I did not mind that there wasn't any lipstick in there. 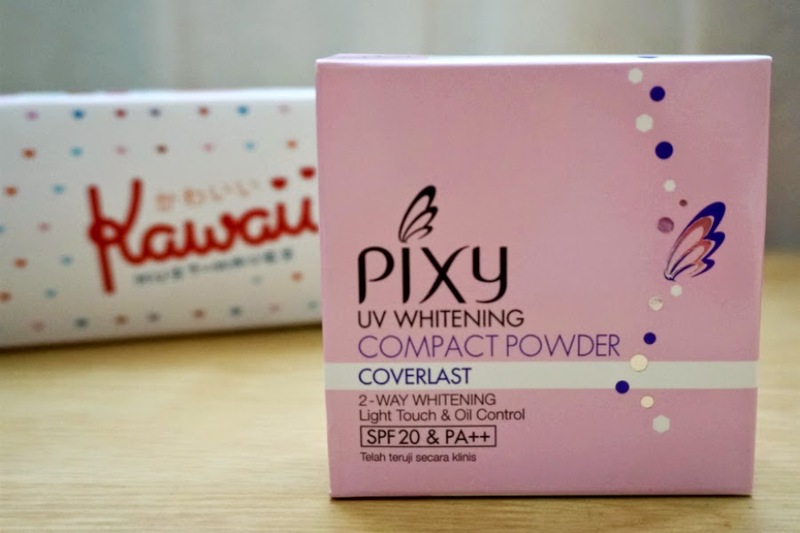 One thing to note is how sleek and cute Pixy's packaging looks. I love how shiny they are, and how they are very affordable. I can't wait to try these out!